The South African Academy of Engineering (SAAE) has, as one of its aspirations, the promotion of innovative engineering to improve the quality of life for its people. In making the case, the Academy has argued that the competitiveness of nations is highly dependent on their level of technological development. SAAE is a young but growing institution that comprises eminent engineers of all disciplines, who: strive to remain in the forefront of international advances; seize the opportunities for serving mankind; and stimulate the process of skills development and job creation. Election to the Academy is by invitation and there are currently 174 Fellows who have qualified by virtue of their outstanding contributions to engineering. For their personal achievements of exceptional merit and distinction, eleven new Fellows were elected by their peers in 2011. Of these eleven, four were inducted into the Academy in Cape Town earlier this month. 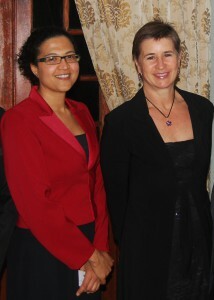 Among the four were two women, both of whom are academics at the University of Cape Town: Alison Lewis, Professor of Chemical Engineering, and Tania Douglas, Associate Professor of Biomedical Engineering. Tania, who serves as a director on the board of CapeRay, is a leading South African scholar in the field of medical imaging. During the past ten years she has conducted research on major public health problems, including the development of innovative instruments for diagnosing fetal alcohol syndrome and tuberculosis. In addition, she has authored many journal articles on the application of low dose X-rays to paediatric trauma and has published a recent paper on digital mammography in Physics in Medicine and Biology. CapeRay was privileged to be able to contribute to the induction ceremony by sponsoring the dinner. CEO Kit Vaughan, who was elected a Fellow in 2006, was the guest speaker and delivered a presentation entitled “Diagnosing breast cancer: an opportunity for innovative engineering”. His talk encompassed imaginative contributions through the ages, from Imhotep, the engineer and physician who first described breast cancer over four thousand years ago, to his own team of engineers at CapeRay who have developed the PantoScanner. While biomedical engineering is a relatively young discipline, it nevertheless has the potential to contribute towards South Africa becoming a winning nation.